UpCurrent's product aims to streamline communication to combat inefficiencies, promote feedback and increase employee engagement. UpCurrent has asked our design team to re-design the product to meet the users' needs. UpCurrent has an MVP with pilot programs in various industries. To focus our research during the sprint, we agreed to narrow the scope. During the stakeholder meeting, we identified frontline employees in retail as the target user group. Encourage end-users to provide valuable ideas to management. UpCurrent believes that improving communication will boost morale and increase retention. Employees in bottom-heavy organizations (such as retail) often have valuable ideas, but they do not feel that there is an open environment to collaborate with management. UpCurrent’s value to businesses is dependent on active participation of frontline employees. At the start of the sprint, there were minimal contributions from the end-users. By understanding why end users would want to contribute ideas and what is preventing them from doing so, we can determine how to create an open environment for discussion. We will first conduct research and then hypothesize features to meet users' needs. We will then create prototypes and iterate based on our findings. UpCurrent's MVP was designed solely from a management perspective. There was a lack of contributions from end-users and a lack of research conducted on the users. Our design team conducted usability testing on the current MVP to validate the usability of the existing MVP. We guerrilla tested UpCurrent's MVP with 5 retail employees. We tested the current product with end-users in context to identify user needs and opportunities for improvement. During the usability testing, we found major issues with the usability, which will drive insights for our redesign. Employees were afraid of being treated negatively or being fired for contributing ideas. This was a major pain point we encountered during user interviews. By allowing employees to post anonymously, we can empower them to freely contribute ideas and suggestions. Without the anonymity feature, many employees would not feel comfortable enough to contribute ideas. Most communication was face to face. Employees had to track down managers to talk to them and could only communicate with the managers currently in the store. Some employees had a close relationship with their coworkers while others felt like outsiders. The ones who lacked a connection with their coworkers did not feel like they belonged in a community. These employees were unsure about how their peers felt about issues. Meetings were mostly held to discuss numbers and inventory. Frontline employees expressed that these meetings were a waste of time and that most of the information could be communicated in a few minutes. The employees also expressed interest in having meetings to discuss ideas and suggestions. Some employees have faced negative repercussions after communicating feedback to management. Employees who have been in this situation are reluctant to communicate ideas. Other employees are open to contributing ideas but their suggestions are rarely implemented or lost upstream . These employees are reluctant to continue making suggestions. Anna is a part-time employee who does not feel like she has a voice. She does not have a close relationship with her co-workers and does not know how they feel about certain issues. She is afraid of backlash from management because she has heard stories of employees being treated differently after voicing their ideas. Max is a full-time employee who has a close relationship with employees and management. She is often the voice for other employees who are afraid of voicing feedback. She is comfortable making suggestions but she is frustrated when her ideas are lost upstream. We looked at anonymous messaging sites such as Whisper and Yik Yak. When users were truly anonymous, they were open to communicating openly. Looking at TINYpulse, we found that feedback is always anonymous in the workplace. Flashbrand allows employees to provide anonymous feedback or to attach their identity to their ideas. We created user stories to focus on what the product needs to do to address the users' pain points. After creating user stories, we began to brainstorm ideas for user-centered features. We started off with paper prototypes because they were low fidelity. This allowed us to draw out our ideas and to iterate quickly. After designing a new prototype, we conducted usability testing on 5 users and iterated based on our findings. At the end of the 2.5 week sprint, we created 3 versions of the home page. Posting at the Top - We need to make it easy to create a post so that employees will contribute ideas. 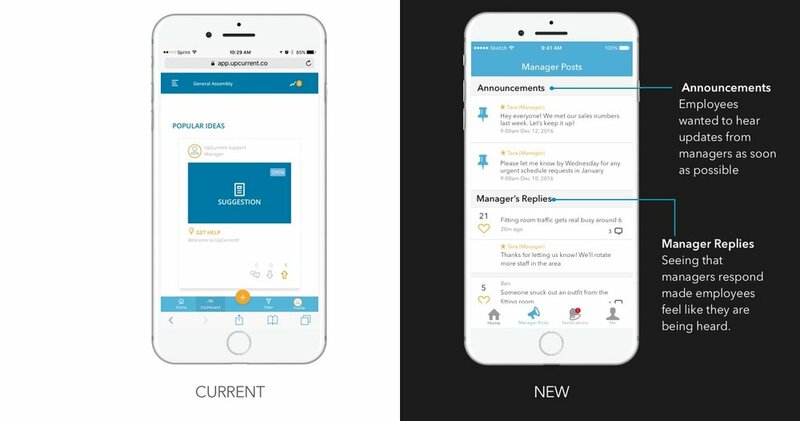 We redesigned the app to make the ideas the prominent feature of the app. In the existing MVP, the tiles were distracting the users. Pinned Posts - Employees can easy locate important announcements from management. Since employees mostly checked the app during breaks or right before work, they need to quickly find any store updates. We found during user interviews that employees want to hear updates from management in a quick and efficient manner. Employees did not want to waste time at status update meetings. Anonymous Posts - During user interviews and testing, employees were more likely to contribute an idea if they can remain anonymous. This is crucial for employees like Anna who would not contribute ideas otherwise. Positive Feedback - Employees stated that they would be less likely to contribute ideas in the future if people downvoted their idea and made them feel like they had a bad idea. Only allowing positive feedback makes employees feel like there are no bad ideas. In addition, this creates a sense of community. This allows employees like Anna to see how her co-workers feel about certain issues. Reorganized Global Navigation - Home, Manager Posts, Notifications and Profile Page. By reorganizing the global navigation, we found that users were able to learn the app by just clicking around. When we tested our prototype, users did not need a tutorial to understand how to use the product. During our usability testing and user interviews, we discovered that employees wanted a way to hear announcements from management. In addition, employees stated that they are more likely to contribute ideas if managers reply. Max will know that her ideas are not being lost upstream if she sees that management responds. The current MVP has barriers to posting a suggestion since employees would have to figure out how to categorize their ideas. The proposed solution has simplified the process and allows employees to immediately post an idea. Through interviews, we found that most people were afraid to contribute ideas if they are unable to do so anonymously. The default post is anonymous but we did find some scenarios where employees wanted to post an idea and be recognized for it. We gave the user an option to either post anonymously or display their name. Employees like Anna would want to post anonymously but employees like Max would want to display their name. The current MVP does not have a notifications screen. During usability testing, we found that employees would mostly check the app right before a shift or on breaks. There needed to be an easy way to quickly check new information. Creating a notifications tab allowed employees to quickly check new information and information pertinent to them. During usability tests, users were focused on their own posts and activity and had difficulty finding it. The current MVP does not have a profile page. The profile page personalizes the experience for the user and allows the user to easily find their personal stats and their past posts and activity. We focused on the frontline staff during our design. Getting employees to contribute ideas is vital to the product’s functionality. However, if and when employees are open to contributing suggestions, we will need to design for the management side. To test out how and if frontline employees will use the product, we need to evaluate metrics overtime and see if the product has made an impact in the work environment. From our findings, we can iterate the product to meet the employees' needs. During our research, we interviewed employees in the food industry and supply-chain management and found that these employees experienced similar issues. To build a product for various industries, we need to conduct extensive research to figure out how to design for them.